As the school year ended, the parents of the students going from 4th grade to 5th grade asked for some summer book recommendations. In our Waldorf school, the fourth graders generally turned 10 during the year, and in fifth grade, they will be 11. Here’s a short list of my favorite children’s books for this age, with links to the books embedded. Click to read the review. 1. 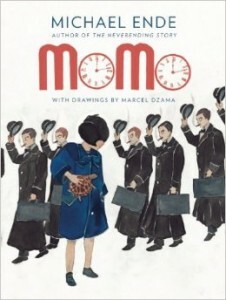 By all means at 10 years old, it is time to read Momo, my all-time favorite book, written originally in German by an anthroposophic author. Suitable for boys or girls. (Also great classroom book.) My favorite edition by McSweeneys appears to be out of print, but used copies are available, and adequate paperback editions are also available. 2. Two books by Clements – Frindle and No Talking.. both set in 5th grade classes, and both very funny. Suitable for boys or girls. I love them both. Very fun summer reading. 3. Bud, not Buddy, about a 10-year-old African-american orphan during the depression. 4. For somewhat reluctant readers, The Fog Mound books are half graphic novel, half prose, and a good Utopian story after the world has ended and is now run by all the kind animals. 5. The Lost Track of Time – sort of like Phantom Toll booth, good for boys or girls. If you want specific suggestions based on what your kids like, just email me, using the contact us form. You can always use the link “ages 9-12” to scroll down and see quick blurbs, including specific age recommendations and themes. (At the bottom of each page, just click “more books”, to see more…There are 236 in that age range, though some are for 11 and up.) Every book is available in the Sonoma County public library.